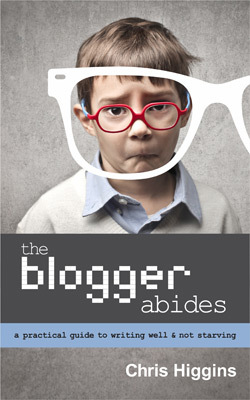 The Blogger Abides is an ebook for freelance writers, written by longtime freelancer Chris Higgins. If you want to get paid to write, this is the book for you. But let's be clear: this is not about getting rich, or even getting paid particularly well; it's about how to find and manage your first gig, how to incrementally improve your work and your paycheck, and how to manage both the business and creative aspects of a writing career. Why does the world need another book about writing? It doesn't — it needs a book about how, in 2013, writers actually do work for money and all the business stuff that goes along with getting work, running your tiny business, and not starving. That business-ish stuff includes paying your taxes, dealing with retirement savings, issuing invoices, signing contracts, understanding LLCs, and all kinds of things that are never mentioned in books solely about craft. But The Blogger Abides also includes a ton of info about the specifics of the early freelancing gigs you'll get (hint: you'll be writing online for peanuts), and the specifics of that craft. If you have a Kindle (or a Kindle app on your phone, tablet, or computer) you can grab a free sample and decide whether it's worth tossing a few bucks at your writing career. I don't have a Kindle. How can I read this? Easy: download the free Kindle app for your computer, phone, tablet, or Smart Fridge. (Apparently you can also read Kindle stuff via a web browser plugin, though I wouldn't recommend it.) In short, if you are reading these words, you have a device capable of reading Kindle ebooks. Probably not. Only if people email me to request a print version will I go there — there are a whole set of extra costs and hassles with print that I'm hoping to avoid. Yep. Amazon lets you send 10% of the book to any Kindle device or app (check the "Try it free" box in the right column of the book's Amazon page). If that's not enough for you, check out Chapter 27: Stock and Flow or Chapter 77: Frequent Offenders (the latter is an appendix). I'm broke but still want to read this thing. If you're an Amazon Prime member, you can borrow the book for "free" (after the cost of the membership, anyway) from your Kindle device. That actually kicks money back to me. So you should do that. Did people really ask these questions "frequently?" No. But thanks for asking! I write for Mental Floss, The Atlantic, The Magazine, and This American Life. How to find me online: I'm @chrishiggins on Twitter and I'm on Facebook. © 2018 Chris Higgins; all rights reserved. Email me for reprints, interview requests, tech support, recipes, tips on planting indoor flowers, or just to chat. Chris Higgins is a participant in the Amazon Services LLC Associates Program, an affiliate advertising program designed to provide a means for sites to earn advertising fees by advertising and linking to Amazon.com.